Edinburgh, as the Scottish capital, is a powerhouse of industry, employment and culture. It’s also one of the most magnificent metropolises in the UK with the imposing Edinburgh castle and cobbled streets of the Royal Mile showing off the city’s rich historical legacy. If you’re thinking of moving to Edinburgh then you’re definitely looking in the right direction. The city enjoys the highest average earnings of the UK outside of London, it has low levels of unemployment and one of the strongest financial sectors in the world. However, the thing that stands out most about Edinburgh is undoubtedly the culture. It plays home to the most celebrated New Year’s celebrations in England (You’ll need to learn the words to Auld Lang Syne!). It hosts the Edinburgh Fringe Festival every year which is the largest arts festival in the world – with almost every pub, bar, club and venue in the city showcasing everything from live music, shows and stand-up comedy to emerging artists and street performers. Edinburgh is also one of the best places to eat out in the country, with four Michelin starred restaurants and hundreds of other delicacies on offer – though we don’t personally recommend the Haggis! Last, though not least, let’s not forget the whisky – Scotland’s national drink flows in abundance here and you will have the opportunity to savior the finest collection of single malts available anywhere in the world! With that in mind we decided to delve deeper into everything you need to consider about moving to Scotland. Edinburgh’s job market is buoyant and growing. Scotland’s GDP growth has outstripped the UK average in the last year with economic output now standing at over $43,415/head. Edinburgh itself has the lowest number of people claiming job seekers allowance in the country with just 3.2% of the population claiming these benefits. Overall this is one of the best cities to live in the UK – especially when we take into consideration the relative cost of living compared to London and other major UK cities. Edinburgh has a diverse economic structure but there are some core industries flourishing here. Finance – The most important of these industries is the financial sector – with the second largest financial services market in the UK and the 65th largest in the world Edinburgh has a diverse market with major companies and lots of opportunities. Technology – Edinburgh has a thriving technology industry and is home to a number of well known companies and an even large start-up technology scene. The three major universities provide a wealth of research and innovation whilst you will also find companies including Skyscanner, Fanduel, Craneware, Amazon and Rokstar North based here. Creative – Edinburgh is the cultural capital of the country with an incredible program of 12 major festivals throughout the year generating over $248 million for the local economy. For creative professionals the TV and Film industry in Scotland rivals that of London, for artists, musicians and performers the Fringe festival creates untold opportunities while the PR, Marketing and Media industries are amongst the best in the UK – with over $1.24 billion being generated from these industries alone in 2013. Tourism – As the second most popular destination in the UK Edinburgh has a thriving tourism sector with over 4 million visitors a year to the capital and $1.49 Billion in revenue generated. With its architecture, history and beauty there are few places in the UK as exceptional for tourist professionals. Renewable energy – Edinburgh has the largest renewable energy production of Scotland and this is likely to be an area of huge expansion in the coming decades with $124 billion being invested in offshore wind farms in the next ten years alone. Outside of these core industries Edinburgh has a huge number of established and emerging industries. Edinburgh is an expensive city by UK standards but not when we compare it to the capital London. Average rents for a 1 bedroom apartment stand at around $810pcm. For a large 3 bedroom apartment expect to pay around $1,240 a month. If you decide to live outside of the city center prices are much more reasonable. A single bedroom apartment outside of the city center will cost around $620pcm while a house in the suburbs will cost around $993pcm. The city’s transport infrastructure is very reasonable with monthly travel tickets from around $81. For eating out and drinking prices are similar to the UK average – cheap meals for $12.40, mid-range meals for around $31 (two courses), and beer at around $4.35 a pint. Entertainment is so plentiful in the city that you can enjoy cheap live events every day of the year – whether its theatre, music or comedy! The average property price in Edinburgh is $285,220. City center properties are significantly more expensive than those on the outskirts with the average city center apartment costing $421,800. Further out you can buy a 3 bedroom house for $272,930. The area you buy will dictate the price you pay more than anything else – property prices start from just $136,465 but scale upwards with area. Ravelston, Murrayfield, Fairmilehead, Colinton, Braepark, Cramond, The Braids and Belford are six of the richest suburbs in the UK and house prices match accordingly. These are beautiful places to live but if you want something more vibrant and cultural try Marchmont, Tollcross, Oldtown or Grassmarket. Though these are student areas they offer great culture and superb nightlife. Family-friendly: Bruntsfield/Morningside is an affluent, family-friendly area full of quirky independent shops, good schools and a wide range of cafes, pubs and restaurants to cater for all the family. Another area that is popular with families as well as tourists is Stockbridge, just to the north of the city center. It has a quaint feel, with classical architecture and cobbled streets throughout. Upmarket: New Town was built in the 18th and 19th century to accommodate the ever-growing population of Edinburgh and consists of stunning, wide avenues and Georgian townhouses. The affluent area is full of professionals, expensive homes and a thriving independent retail scene. Hip & trendy: Including Calton Hill, Calton adds a little bit of Greenwich Village to Edinburgh, being in close proximity to a busy area full of restaurants, pubs, bars and exciting nightlife. It also consists of part of Edinburgh’s Pink Triangle, the gay friendly area of the city. Up & coming: The old port of Edinburgh, Leith has in recent years started to find itself a new space within the city landscape. It is continually in the process of rejuvenation and with a cracking seafood restaurant scene and thriving pub and shopping locations, it is the next great neighborhood of this fine city. In terms of costs to move to Edinburgh you will usually need to pay upfront accommodation deposits of two month’s rent. In addition you will need to ship your belongings. If you’re moving from within the UK then a removal company can do the legwork. Edinburgh has the best education system in Scotland and one of the best higher education systems in the country. There are 39 secondary schools and over 100 primary schools within Edinburgh and the outlying regions. Edinburgh has some of the country’s highest rated private secondary schools including Cargilfield Preparatory, Dunedin and the prestigious Edinburgh Academy. In terms of higher education Scotland has four universities including the prestigious University of Edinburgh itself. As the capital city of Scotland you would expect the cost of living to be quite high, and though it is higher than other parts of Scotland itself, Edinburgh offers comparable value to Glasgow and much greater value than other parts of the UK. When comparing the cost of rental and property prices Edinburgh offers better value for money than London and even some cities in the South of England such as Bristol. Getting around the city is easy with a healthy public transport system consisting mainly of buses and trams. A day ticket costs around $5, which ranks as great value when comparing it to other major UK cities. We all know that Edinburgh is famous for its annual arts festival, taking place each August, with the fringe festival becoming bigger and bigger over the decades too. 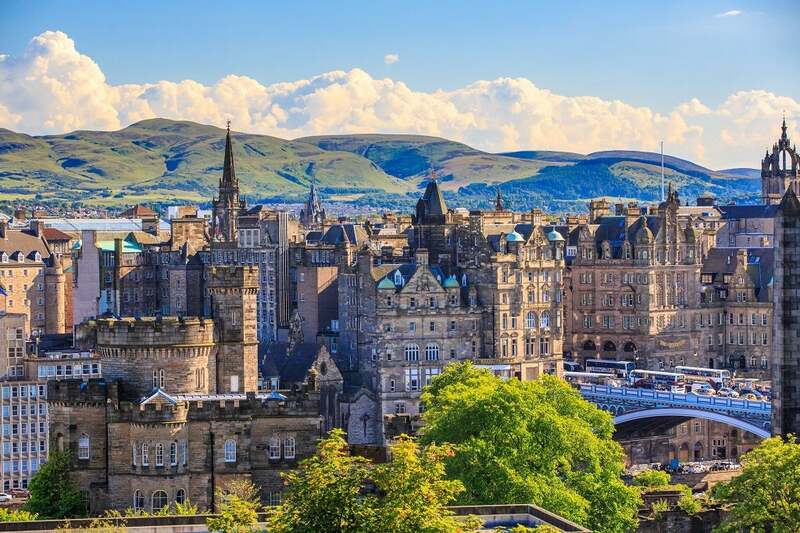 Living in Edinburgh though there is so much more to see throughout the rest of the year and Scotland’s capital is widely recognised as one of the most beautiful cities in the UK to live in. The views are spectacular from much of Edinburgh but no more so than from the Castle and Arthur’s Seat. The castle offers great views of the city as well as centuries of history, with the Stone of Destiny and Crown Jewels a great family attraction. Arthur’s Seat gives you absolutely breath-taking views of the entire city, a great place to stop, stare and take it all in after a walk through Holyrood Park. Camera Obscura is another fascinating destination and has been offering a live moving panorama of the city for 175 years, well worth a stop! In fact, Edinburgh is one of the great walking cities of the World, with its stunning views and magnificent architecture at every corner it really does ooze history. For shopping there are a number of options, from the central St James shopping center or the Gyle center to the west of the city center. Really though, Edinburgh is famous for its independent scene for shopping and in most areas of the city you’ll find amazing, quirky boutiques, record shops, designers, bars and restaurants. It is a vibrant place to live. On a weekend you’ll have the choice of shopping or sport in most cases and Edinburgh doesn’t disappoint in sporting terms. Two historic football clubs are based in the city, Hibernian play at Easter Road and Hearts play at Tynecastle (recognised as one of the best football away day in the UK). For Rugby you’ll find the national team playing at Murrayfield in the Autumn internationals and during the 6 Nations from February each year. Edinburgh really is a spectacular city to live in no matter what you are into.